prevent greenhouse gases equivalent to the emissions of more than 800,000 cars. There are about 4 billion household light sockets in the United States - about 30 in each home. If you replaced 30 incandescent bulbs in your home with CFLs, your average utility bill savings would be about 12 percent. Energy Star Compact Fluorescent Lamps (CFLs) consume 75 percent less electricity than incandescent bulbs and last 10 times longer. One CFL will save $30 in energy costs over its lifetime, reduce coal consumption by 200 pounds, and prevent more than 400 pounds of greenhouse gas emissions. But sustainability is about more than using energy efficient products. It also carries a responsibility to prevent waste of useful materials and to reduce the impact of manufacturing on the environment. For instance, producing an aluminum can from recycled cans consumes 95% less energy than making that same can with raw materials. By recycling CFLs, batteries, and electronics, we reclaim the glass, metals, and plastics used to produce them. But recycling provides an added benefit, as these products contain heavy metals or other toxins that can contaminate the environment if disposed of improperly. Think Green From Home Recycling Kits are designed to provide appropriate storage and transportation packaging for these materials. 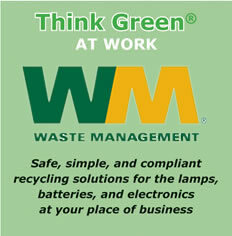 With the Think Green From Home program, recycling is as convenient as a trip to your mailbox.